featuring Chocolate Sprinkles Trendy Twine. so for my project I made a gift set. 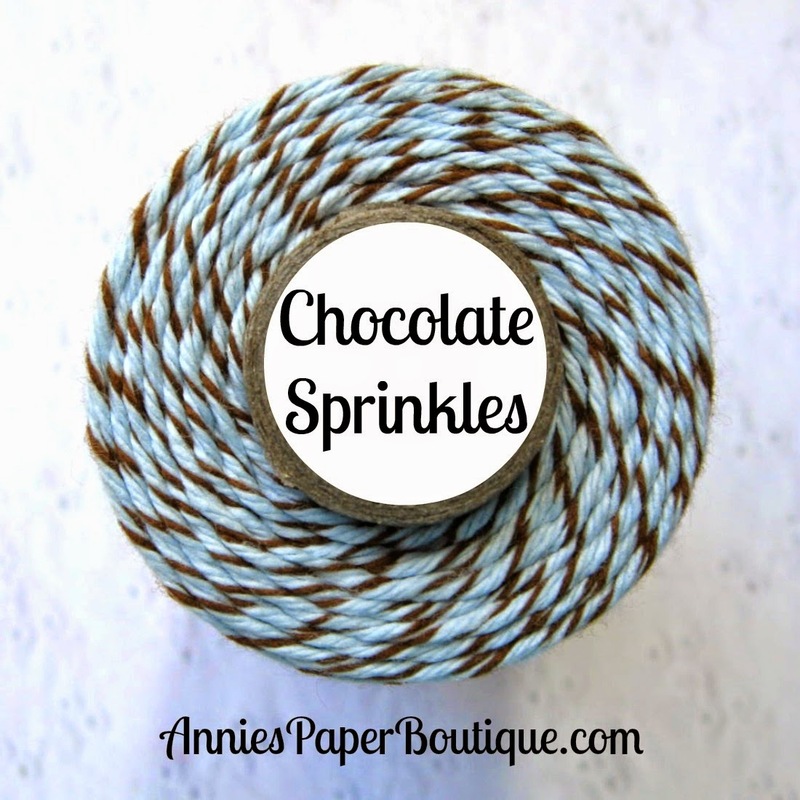 Chocolate Sprinkles Trendy Twine and the Chocolate Boxes, available in the store. The full supply list can be found on my blog. 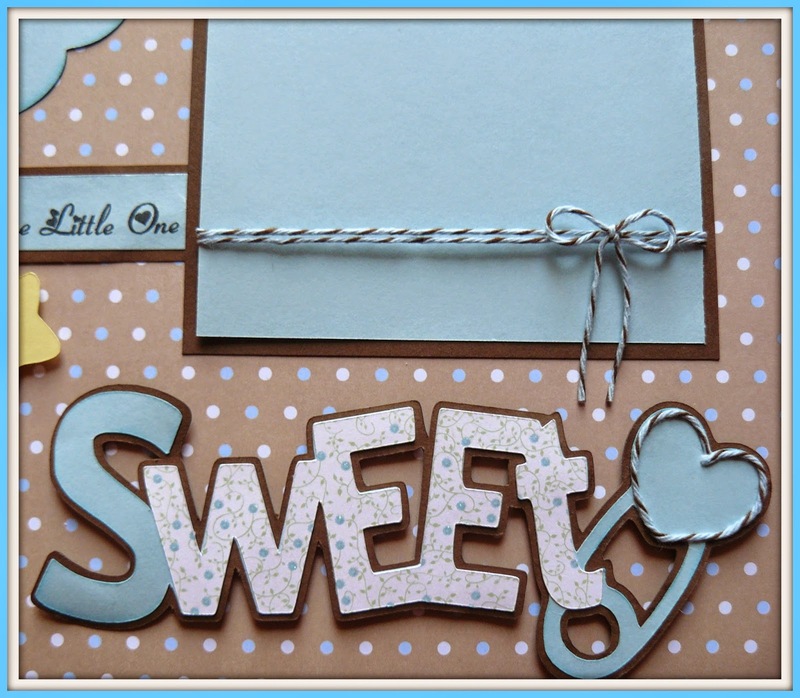 It is Melissa here from M Miranda Creations with another card and favor using the Chocolate Cupcake Trendy Twine. I have some more ideas for you for all those Precious Little Babies in your life! This cute card would be a perfect way to congratulate new parents on the birth of a new baby or to use as an invitation to a baby shower. The file I used for the rocking horse was so easy to put together!!! After attaching the rocking horse with pop dots, I wrapped a bit of Chocolate Cupcake Trendy Twine around the top and attached my tag with the sweet sentiment from My Craft Spot. For the favor, I used the Shorty Candy Chutes (1x3 Clear Boxes) from Lesley's store. We have a local candy warehouse called "b. a. Sweetie" that I perused to find these pink candies to fill it with. I'm not going to admit what other candies I brought home and stashed in my craft room. Ha! I Wrapped the favor with some more sweet Chocolate Cupcake Trendy Twine and again added a tag and bow. 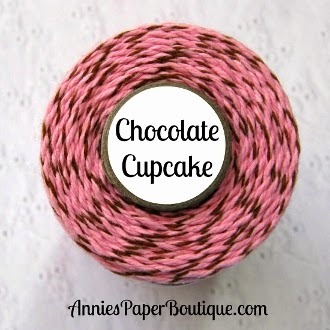 I hope you will stop by the store to grab some of this delicious Chocolate Cupcake Trendy Twine (which is on sale this month) as well as the Candy Chutes. While you are there, take a look around as Lesley has many fantastic products in the store and lots of deals happening right now! If you would like a complete list of all the products used, please stop by my blog. I will list them under the sneak peek I have going on over there of this project! Tammy, here with a card and gift box featuring Chocolate Cupcake Trendy Twine that is now on sale. 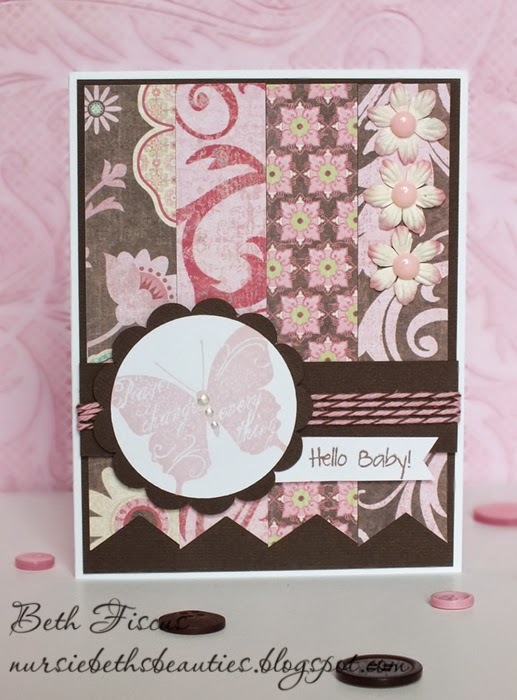 I started with a blush pink card base adding a mix of patterned paper joined by an embossed layer of kraft cardstock. I added part of a doily peeking out from underneath ruffled dictionary pages. Next I took some yummy Chocolate Cupcake Trendy Twine and wrapped it muliple times around the card front adding a seam binding bow embellished with a brown button laced with Chocolate Cupcake Trendy Twine. Lastly, I added a die-cut and sentiment to finish the card. I just love the cute little mini boxes you can find in the store. 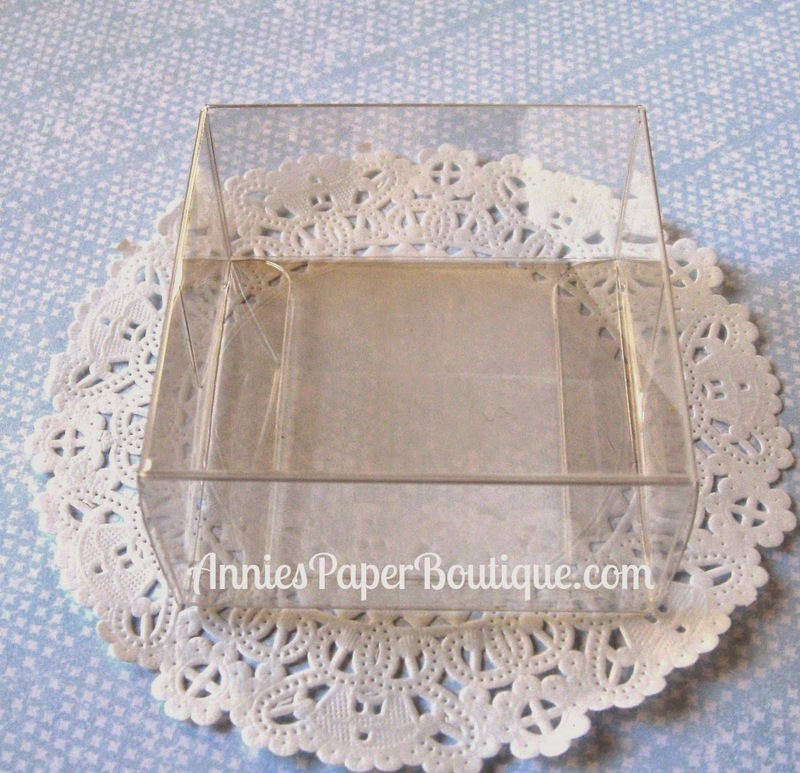 I used the 2x2x2 Kraft Box and you can find these in packs of 10 at Annie's Paper Boutique. I dressed up the box by wrapping more of the yummy Chocolate Cupcake Trendy Twine around the box and tie in a bow. The rest was dressing up the bow with some trimmings I had in my personal stash. Hope you enjoyed my project! Don't forget to check out The Twine It Up! with Trendy Twine Facebook Page! Hello! It's Planner Friday again, they always come round so fast! These are the products I have used for my pages this week. So the photo above is how my week started out and the one below is how it is shaping up now. I love using the At Home Planner Stamps, they save me having to write out the same tasks over and over again each week. It is so much easier just to stamp them on my pages and I like how they look too, so much nicer than my handwriting! I had a few things I needed to do at some point this week so I wrote them down on one of the To Do Journalling Tags. It has the same red and blue stars on it as the Trendy Page Dot reinforcements so I had to use them both together! I also added a little Trendy Twine bow to the tag, I think it looks quite sweet. I have been using the Feeling Happy Planner Stamp Set to record my feelings each day for a while now and I just received the latest set of journaling stamps from Annie's Paper Boutique. They are called the Feeling Funny Stamp Set and you can use them in conjunction with the original stamps or you can use them on their own as both sets contain the "Feeling" stamp. 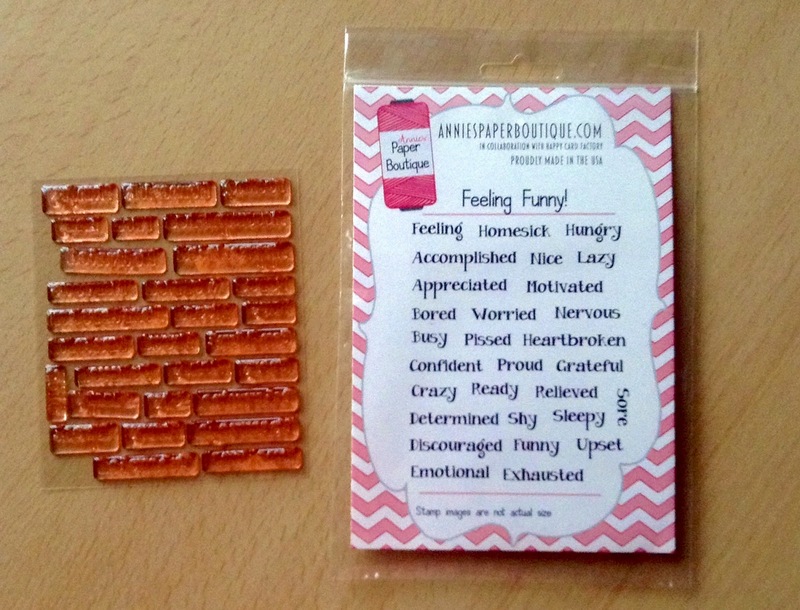 I especially like the Hungry, Sleepy, Proud and Motivated stamps, they cover how I feel quite often! I think between the two sets I have a stamp for nearly everything I could be feeling, it is a great selection. If you read my post last month you might remember I said I was going to start my Christmas planning this month. So far I'm just thinking of gift ideas and things for our Elf on the Shelf to do during his visit but I am starting to feel a little Christmassy! I want to show you the cute Christmas tree paper clips I ordered last month and some fun Christmas coloured Trendy Page Dot reinforcements that are available, I can't wait to start using mine in December. Thanks for stopping by and I hope to see you again next month! Hi everyone! I'm Helen from HTB Creations. 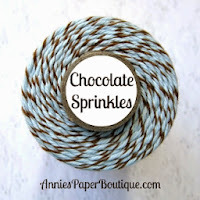 I have a clean and simple card to show you today using the fabulous Chocolate Sprinkles Trendy Twine. I really wanted to show of the Chocolate Sprinkles Twine and wanted it to be a little different on the card. But, it was a bit harder than I thought to keep the twine on that angle. It took way longer than I thought to make it work. There is a bunch of tape holding it in place on the back :) I do like it like that though and will probably do it again! 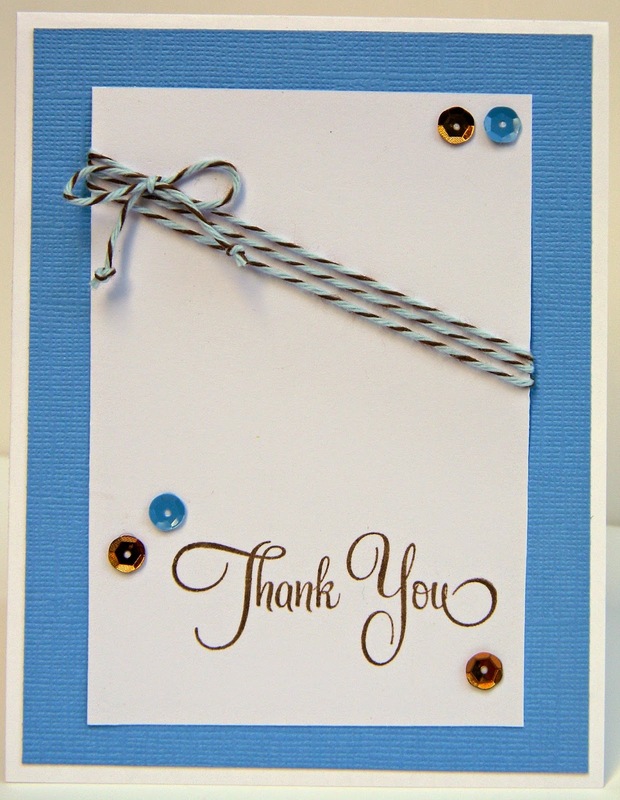 Then I just stamped the thank you near the bottom and added some fun sequins! These cards would work for quick baby thank you cards (maybe not with the twine on an angle) or for just about anyone. Be sure to stop by the Twine It Up! with Trendy Twine Facebook page to see lots of fun projects and also check out all the fun products you can get over at Annie's Paper Boutique! It's Shelly from My Paper Love sharing a quick project with you. Have you all been enjoying the spotlight twine this month? 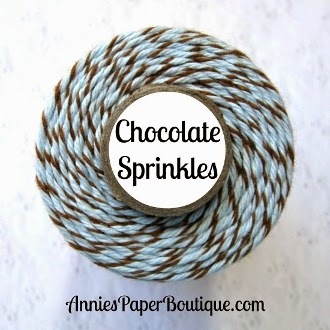 Chocolate Cupcake Trendy Twine & Chocolate Sprinkles Trendy Twine they are both so gorgeous! I'm taking a little break from Baby projects and sharing a Birthday tag using Chocolate Cupcake Trendy Twine. I made a cute little gift tag for a special girl. I used a die cut tag and a PKS stamp for the present. I paper pieced the present using pink and brown and couldn't wait to add this fun little Chocolate Cupcake Trendy Twine pom pom. I LOVE these. I tied a cute little bow at the top added a CDD sentiment and ALL DONE! Easy peasy! It's Millie, from Crafting with Creative M, today sharing my project with you. 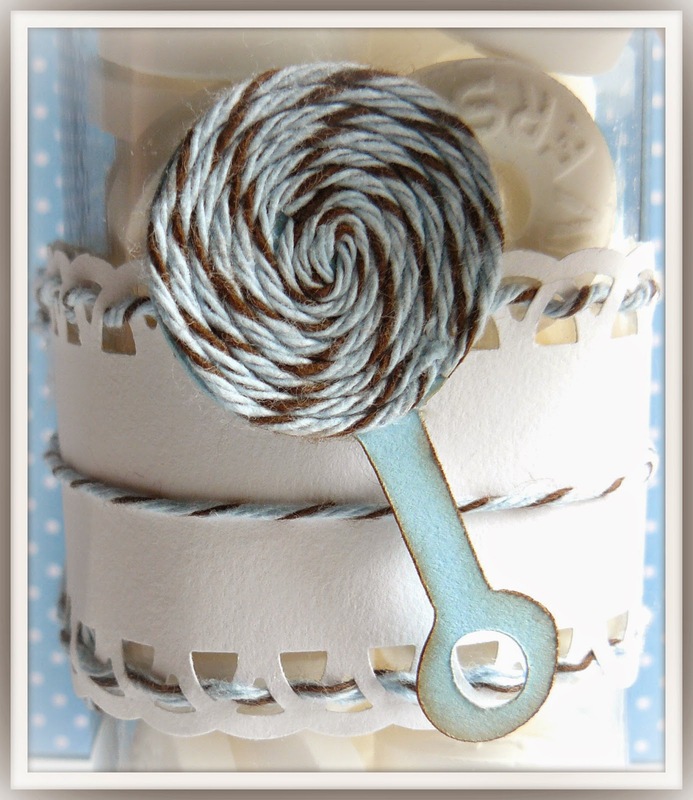 Today's spotlight is Chocolate Cupcake Trendy Twine. I made a Christmas card! Yeap! That's right! I started with the non-traditional colors pink & turquoise, one of my favorite color combo. The adorable Yummy Cocoa is a KBD image. I used the print, cut & offset feature on the portrait. 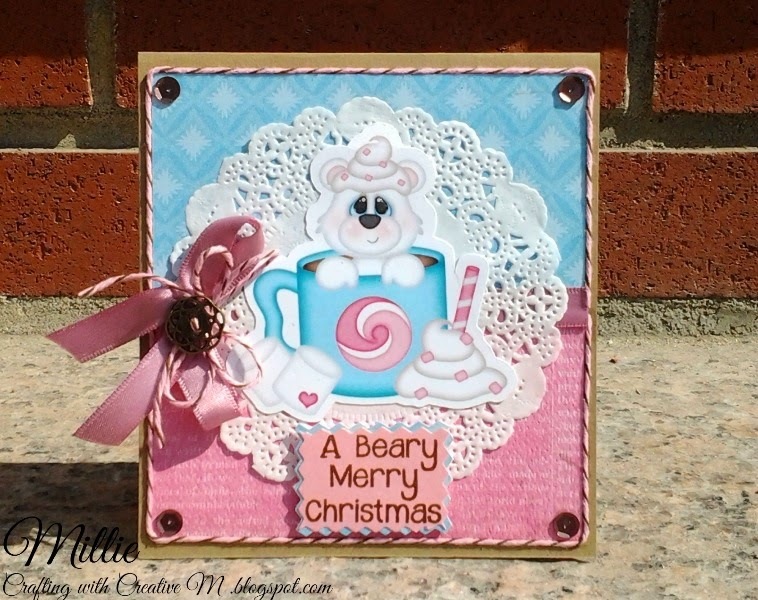 I stamped the super cute sentiment "A Beary Merry Christmas" from CDD's Holly Day Punnies. I wrapped it around the center of my card, and added a pretty little bow. 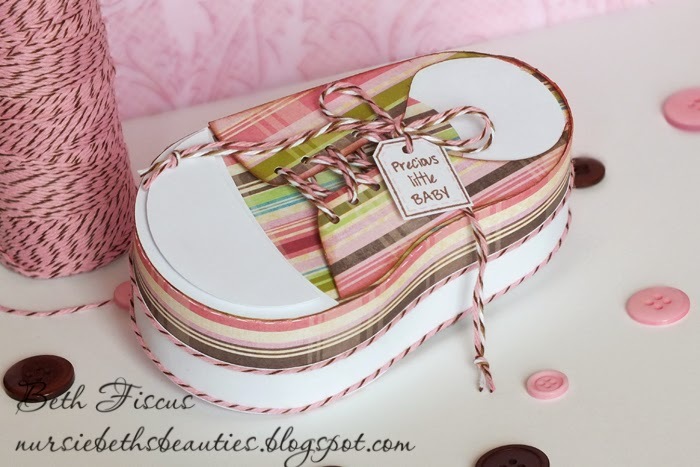 This is Beth from Beth's Beauties, and today I am sharing this adorable tennis shoe gift box. 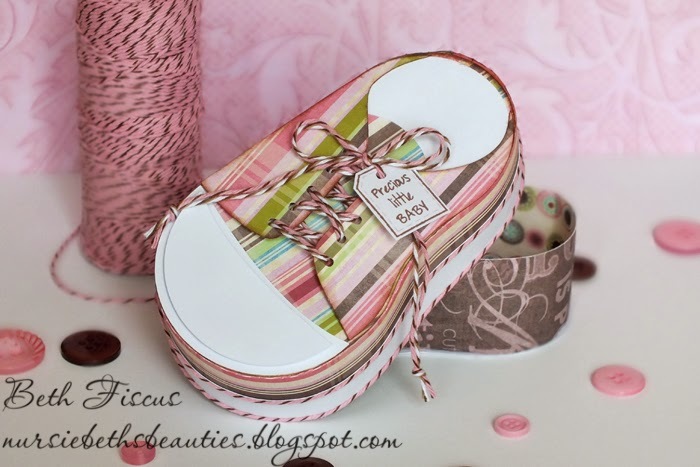 I found this file at My Scrap Chick and totally fell in love with it :) For the shoe laces, I used both Chocolate Truffle and Chocolate Cupcake Trendy Twine. I also added the Chocolate Cupcake twine at the top and bottom of the white strip along the side. And of course, it is a gift box that can hold fun treats! The patterned paper I used was from K&Company. All month the DT has been sharing Baby projects using the Chocolate Sprinkles and Chocolate Cupcake Trendy Twine. 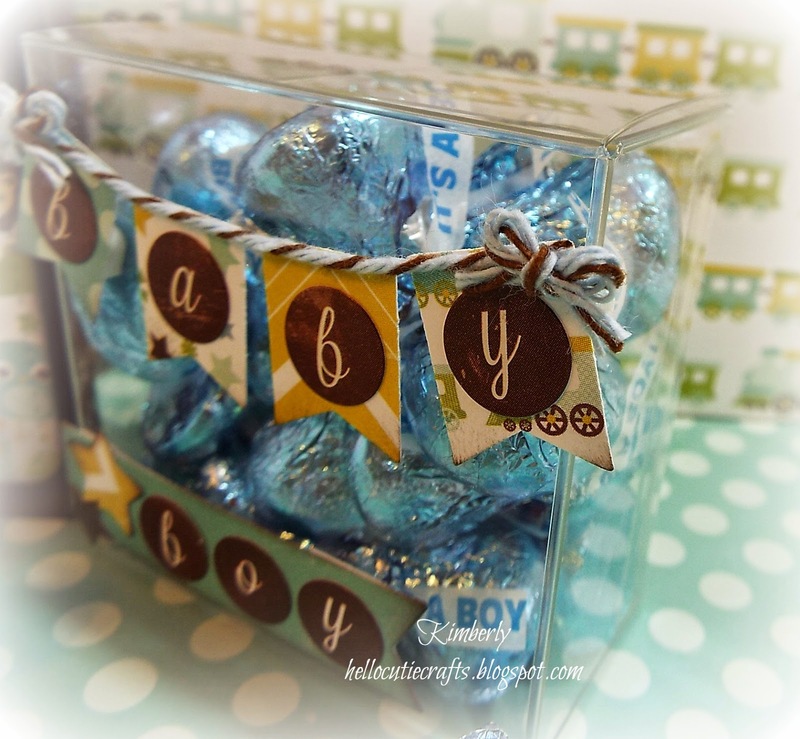 For my project today I made some baby boy shower favors. I really LOVE the way these turned out!!! How fun would these be to give to your shower guests? Now I made mine for a baby boy but change up the colors and add some Chocolate Cupcake Trendy Twine and you can make these for a baby girl too. 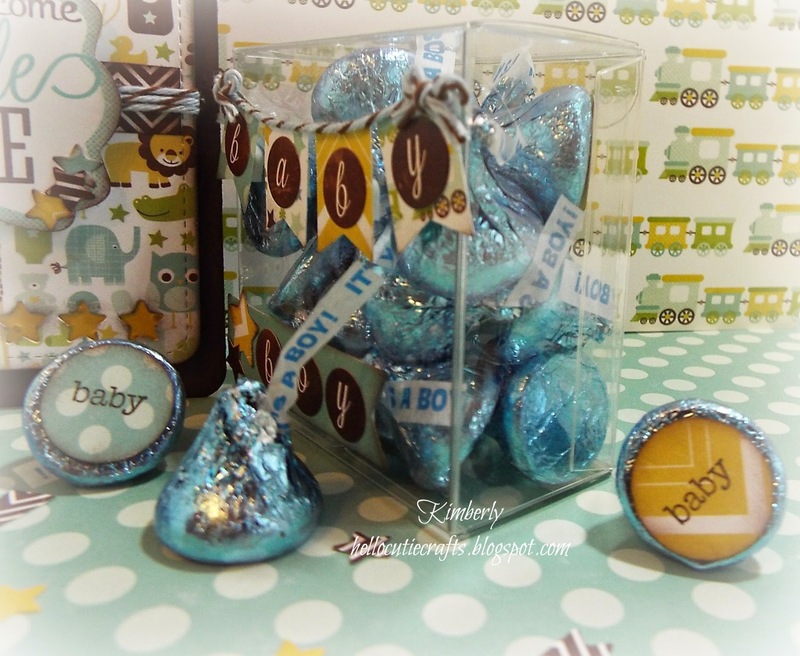 To make these~ which is very quite simple, I used the Medium Candy Bags and wrapped my chocolate nuggets using matching blue and brown cardstock. Once they were all wrapped, I slid them into the candy bags and sealed them up, punching a hole in the top to add my tags. Next, for my tags, I used the dies from My Creative Time and layered some white cardstock on top of the matching brown cardstock. I stamped my sentiment onto the bottom and then using my Cameo and a file I picked up in the Silhouette Store, I cut the adorable elephant. I popped him up onto the tag, adding a black enamel dot for his eye and then tied the tag onto the candy bag with a double bow of the Chocolate Sprinkles Trendy Twine. So aren't these fun???? Sure to be a hit at a baby shower for sure. While you are there make sure to look at these PERFECT baby twine colors!!! Hello, this is Sukie and I have a project featuring Chocolate Sprinkles Trendy Twine which is now on sale. 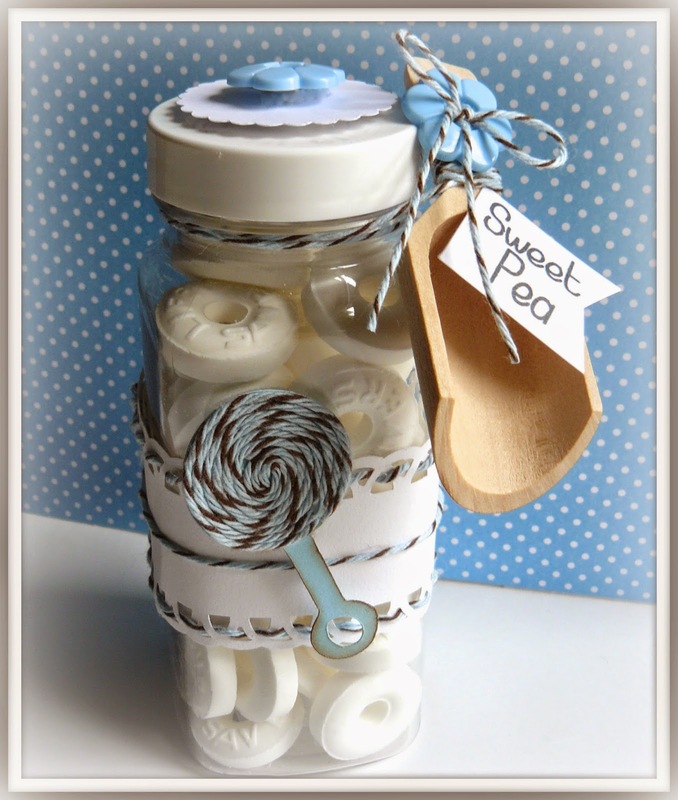 I created a baby shower favor using a plastic milk bottle and a wooden scoop from Annie's Paper Boutique. I punched a border and wrapped it around the bottle. The twine was laced through the holes of the border and wrapped around the center. I added a rattle on top. The top of the rattle was outlined with the Chocolate Sprinkles twine. The top of the bottle was embellished with a scalloped circle and small button. I attached the wooden scoop with the twine and added another button. A sentiment from Craftin Desert Diva's Sugar & Spice stamp set was added to a hand cut flag. Stop by the store and check out this fabulous twine and the 3 new colors just added to the Trendy Twine line up! Have a great day! 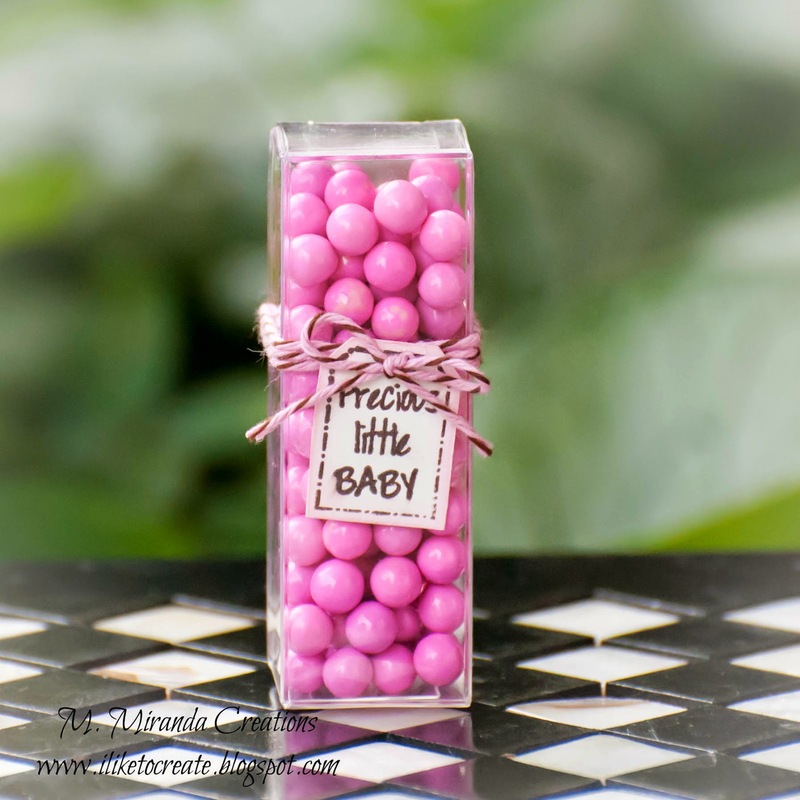 Trendy Baby Shower Favor with a pop! 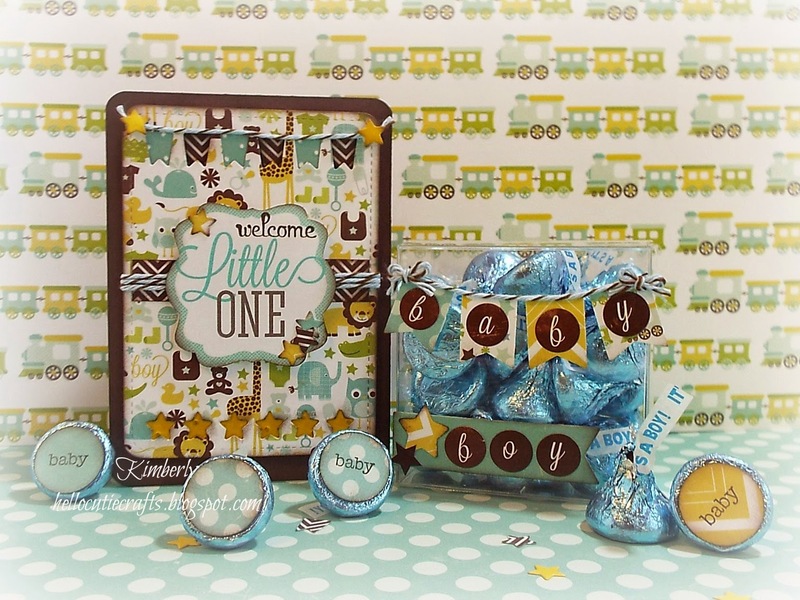 This is Shelly from My Paper Love sharing a baby shower favor with you today! 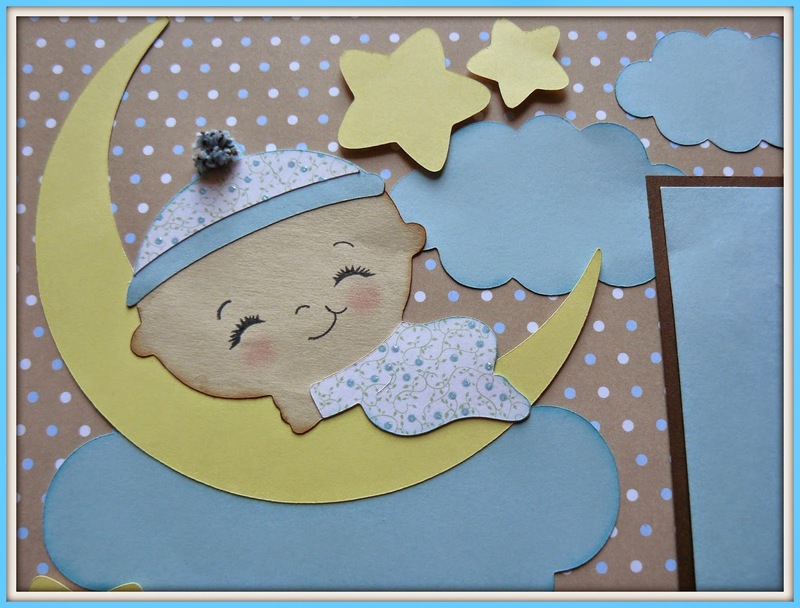 This month the team is showcasing two fabulous colors and making baby themed projects. Today I'm sharing a project using Chocolate Cupcake Trendy Twine, this color is so pretty and sooo prefect for any girly project (my fav). What do ya think? I really think it's fun. I knew I was going to use the Trendy Twine Metal Rim Tags and of course some Chocolate Cupcake Trendy Twine so I just designed this right around those two items. I wrapped the bottle in tulle and then wrapped the Chocolate Cupcake Trendy Twine around the bottle. Next I added a cute die cut label to the top of the metal tags and the I printed the "About to pop" sentiment from my computer. I found some perfect paper to match in my scraps file. I LOVE it when that happens. This was super simple and would look so CUTE sitting on tables or even in a great big basket. You could use pink or blue... Possibilities are endless! Hey, it is Trendy Twine Little Sister, Melissa, here with a project for you today! This month we are showcasing the Chocolate Cupcake Trendy Twine and sharing baby projects. I am very excited about this as I will be hosting a baby shower very soon. This is going to help me brainstorm some ideas. I decided to make a tote to hold baby socks in. This is my prototype for the shower. I will make several of these for table decorations with a paper choice modification to match our colors. This tote with the blue, pink, and brown would be great if the baby's gender is unknown. My finished project for the shower will use this twine though as we know the baby is a girl!!! I really like the chocolate and pink color combo. Here is a view of the back! For a list of all supplies used and a brief description on putting it together, stop by my blog. All of us at Trendy Twine would like to invite you to stop by and pick up some of your own twine or other great crafty products at the store. 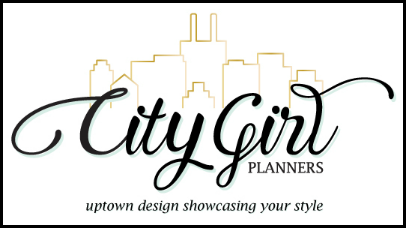 We also invite you to our FB Group - Twine It Up to share all of your Trendy projects. 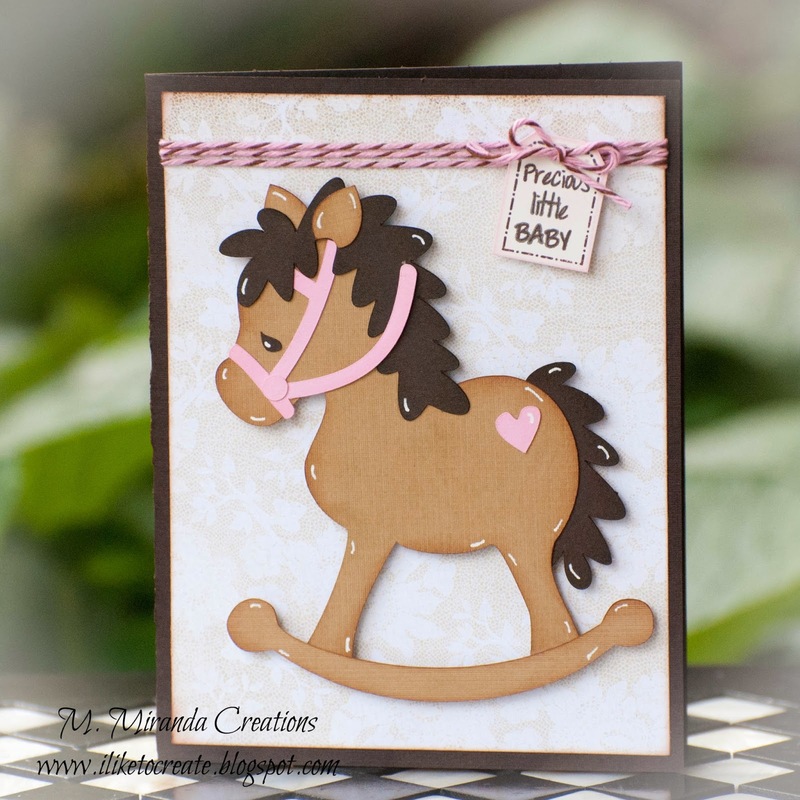 This is Beth from Beth's Beauties, and today I am sharing a baby card with you. Pink and brown is one of my all time favorite color combinations, so I paired the yummy Chocolate Cupcake Trendy Twine with pretty K&Company patterned papers for this project. 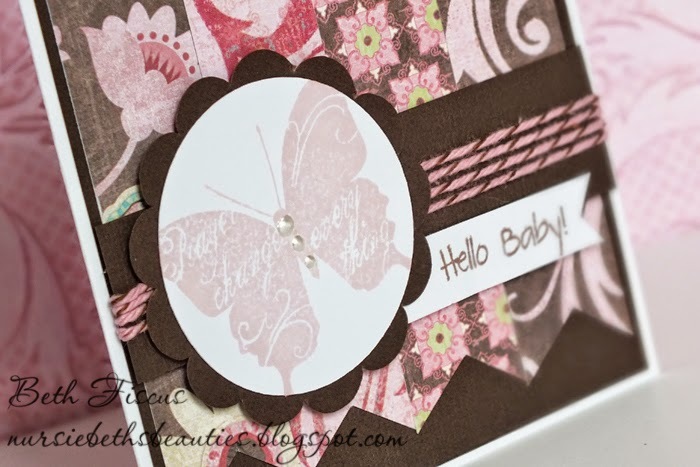 I stamped the butterfly as the focal point and finally added the sentiment. I will have a new nephew later on this year and I wanted to have something for his first picture. I used the New Arrival cartridge for this single page 12x12 layout. A Peachy Keen stamp was used for the baby's face and a small twine pom pom was added to his hat. The twine was also wrapped around the photo mat as an accent and used on the journaling tag and safety pin. A sentiment from the Craftin Desert Diva's Sugar & Spice stamp set was added to a hand cut flag. Product Spotlight~ 2x2 & 3x3 Kraft Boxes!